Rober Sanx started to play the guitar when he was 11. At the age of 16 he made his first instrumental compositions starting to use recording software to create drum and synth parts. He took vocal lessons when he was 20, and he started composing songs with Spanish vocals. He continued improving his skills regarding the use of recording software and he started his career as a producer, composer and arranger at the age of 23, arranging and recording original albums. 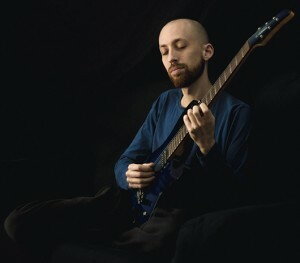 Rober also worked as a guitar teacher for a few years. In 2015 he started to combine his work as a producer/arranger with vocal coaching. Visit Rober on Facebook or YouTube. Rober was one of the first musicians to contact us when we looked out for musicians to collaborate on a common album. He contributed his lovely original song simply entitled “IV”. We thought it would sound great arranged in the style of early 70s Pop music, recreating all the typical sounds, like Moog and Hammond. We added some drum and bass bits that are less common, hopefully you like it! It’s still online, you can find it on my channel. At that time I only had 10,000 subscribers. That video was my call-out for musicians to collaborate on my first Chi Might album and it was amazing to see how many singers and songwriters answered my call. One of the first musicians to contact me was a wonderful Spanish composer, Rob Sanx. In fact, along with ‘Overture’, this song stood right at the beginning of Chi Might. Rober sent an Acoustic Guitar demo of his Song, which we loved. I used the demo to create a drum part, my dad played the bass, then Rober re-recorded his Acoustic Guitar Part and his vocals on top of our new rhythm track. So far we only had Vocals, Acoustic guitar, bass & drums, so my dad approached his former English colleague Rick Benbow and asked him if he might be interested in doing some keyboard parts for the upcoming album. Around that time, Rick was working as an arranger for Status Quo’s AQuostic Album and it was quite exciting that Rick agreed to work on our album too. I had just turned 16 then, so that was quite an honour. This very song was the first song that we worked on together with Rick, so this is also the first chapter for all collaborations that followed, the stunning Arrangements that Rick created for Jadyn Rylee (e.g. Nothin Else Matters or Sound Of Silence) and many more. But back to ‘IV’. Rick created the floating piano lines, his signature Hammond parts and he also came up with those lovely Vintage Synth Sounds that make the track sound so ’70s’. If you have a spare minute, please give the song a listen and enjoy those beautiful harmonies and Rober’s haunting voice!